University of Rome La Sapienza (Italian Università degli Studi di Roma "La Sapienza") is the largest European university and the most ancient of Rome's three public universities. In Italian, Sapienza means "wisdom" or "knowledge." It is known around the world for its excellent medical school and scientific research facilities, as well as its cultural and humanities studies. The institution faced a history of some difficulties as a result of the varying attitudes of popes to the institution, even being closed during the rule of Pope Clement VII, and due to political turmoil. With the establishment of a unified Italy, however, the university flourished, and in 1935 became the present-day state university with a newly designed campus. Today the university offers a wide variety of programs in a diverse range of fields, attracting students from a broad spectrum of interests and areas. Students enjoy not only the quality education offered by the university's teaching staff and facilities, but also the surrounding environment of the historic city of Rome. The University of Rome La Sapienza has a long tradition of providing an excellent education and strives to keep that reputation alive today. The school offers all levels of education, Bachelor's, Master's, and Doctorate Degrees, as well as specialized vocational programs designed to prepare students for specific occupations upon completion of certificate programs. Its location in one of the most historic cities in the world is often emphasized as a draw to students, not just those from Italy but from all over the world as the university makes a conscious effort to draw as much of a mosaic group of students as possible. Domenico Barrière: Sant'Ivo alla Sapienza, ca. 1695. 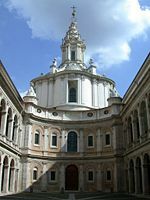 La Sapienza was founded in 1303 by Pope Boniface VIII, as a Studium for ecclesiastical studies more under his control than the universities of Bologna and Padua. It is the most ancient of Rome's three public universities. The future of the school remained uncertain a mere century later when turmoil within the Catholic church produced the Great Schism, in which Popes relocated to Avignon. Still young in its establishment, La Sapienza appeared overshadowed by the other schools at the time. The school was saved, however, by Pope Eugene IV in 1431; introducing a new tax on wine, in order to raise funds for the university and creating an administrative body of a Chancellor and four administrators to oversee the school, Eugene IV essentially ensured the success of the school. 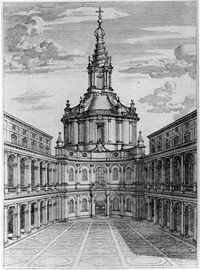 The money raised during this time was used to buy a palace that later hosted the Sant'Ivo church, hence the name later given to the school La Sapienza. The centuries that followed brought many hardships to the school. Pope Clement VII closed the school in 1527 and kept it closed for his entire reign. It was opened by Paul III who succeeded Clement, but times remained rough for the university. While the university improved its establishments, purchased more land and grew in size, the university's educational prospects diminished in the seventeenth century. Lax administration and a decline in discipline among instructors adversely affected the reputation of the school. However, a series of strong Popes dedicated to the success of La Sapienza in the late seventeenth and early eighteenth centuries helped to turn the school around. 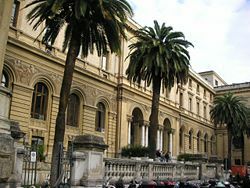 In 1870, La Sapienza ceased to be the papal university and became the university of the capital of the newly unified Italy. In 1935, the new university campus, planned by Marcello Piacentini, was completed. In the academic year 2006-2007, La Sapienza had 21 departments, 138,000 students and was the largest university in Western Europe. 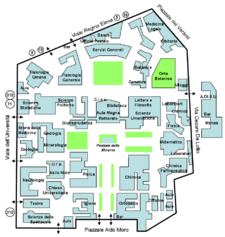 It has many locations in Rome, but is mainly situated in the Città Universitaria, near Termini Station. La Sapienza - Engineering faculty at Via Eudossiana, Roma (Italy). The University of Rome La Sapienza has an "open campus," a term used generally to describe urban colleges that are not centrally located in a single geographic space, but are made up of a collection of buildings and structures spread out over a large area and are usually not connected. Because of this, many buildings belonging to the university are far from another, separated by city blocks and structures. Nearly all the departments have their own buildings, and for those requiring them, laboratories and other research facilities. The university has more than 100 libraries, most of which are specialized by department and course of study. While a good deal of these libraries are very old, in recent years, under the Libraries of Wisdom project, the university has started to utilize virtual libraries more and more. The university has 21 museums, that focus on innovations in science, art, and technology. Most of these museums are products of twentieth century expansion projects, although they showcase items far older. The university also has theaters for both drama and cinema and art galleries for student works. The Plant Biology department has maintains Botanical Gardens and the medical studies has clinics and a hospital for study and experience. The university offers programs at all levels of degrees, in most areas commonly found in Liberal Arts schools. In the humanities, the school maintains programs in Philosophy, Literature, Classical Studies, Religion, Languages, History, Fine Arts, and Drama. In the sciences, the school has programs for the main four branches: Biology, Chemistry, Physics and Geological studies. Architecture, various fields in Engineering, Politics, and Economics round out in the undergraduate programs. At the graduate level, the school offers advanced degrees in clinical and internal medicine, psychiatry, neuroscience, law, the sciences, and most humanities subjects. Centro Ricerche Aerospaziali, responsible for the Italian rocket program, based on San Marco platform. SPES - Development Studies, research center on Development studies at La Sapienza. Psychiatric Reabilative Dell'Eta Evolutia, research and treatment center dedicated to helping treat children with developmental/emotional/and neurological problems. The student population at the University of Rome La Sapienza is a diversified cosmopolitan group. Native Italians, Europeans, and students from around the world make up the over one-hundred thousand students enrolled. Like most universities, La Sapienza offers numerous activities for students. There are many clubs and student organizations associated with the school. The university hosts a large, diversified athletics department open to all students that offers everything from inter-mural teams for football and track, to classes in wellness centered physical activities. Those that do not participate directly in athletics have the option of attending sporting events at the universities numerous arenas. There are also plays, concerts, and guest lectures that the university hosts for its student population. Outside of school sanctioned or produced events, students have the entire city of Rome at their disposal. Rich in history, architecture, art and culture, along with the modernity of a world-class city, Rome offers students of all disciplines enormous opportunities to keep busy and ensuring that their academic studies are well-balanced with experiences in society. ↑ Istituto di Storia del Diritto Italiano Retrieved February 3, 2008. ↑ Aboutroma.com, 2007, "The Story of La Sapienza" Retrieved February 3, 2008. ↑ Catholic Encyclopedia, University of Rome Retrieved February 3, 2008. ↑ Sapienza di Universita Roma, "Students" Retrieved February 3, 2008. History of "University of Rome La Sapienza"